Latinos comprise 14% of the U.S. adult population and about half of this growing group (56%) goes online. By comparison, 71% of non-Hispanic whites and 60% of non- Hispanic blacks use the internet. Several socio-economic characteristics that are often intertwined, such as low levels of education and limited English ability, largely explain the gap in internet use between Hispanics and non-Hispanics. Just 29% of Latino adults have a broadband connection at home, compared with 43% of white adults. This is mostly due to the fact that Latino internet users are less likely than non-Hispanic white internet users to have any type of internet connection at home (79%, compared to 92%). Among the 79% of Latinos who do have a home internet connection, 66% have a broadband connection, which is actually similar to the rate among non- Hispanic white internet users with a home connection (68%). Source: Susannah Fox and Gretchen Livingston. Latinos Online. Washington, DC: Pew Hispanic Center/Pew Internet & American Life Project, March 14, 2007. This report is based on the findings of a series of telephone surveys conducted June through October 2006. Data related to Hispanics was gathered through telephone interviews conducted by International Communications Research between June 5 – July 3, 2006, and August 10 – October 4, 2006, among a sample of 6,016 Hispanic adults, aged 18 and older. For results based on the total sample, one can say with 95% confidence that the error attributable to sampling and other random effects is +/-2.07%. 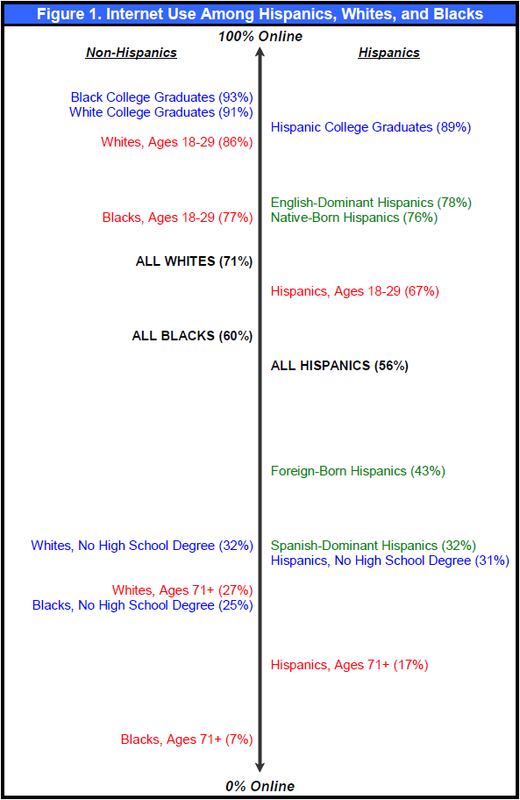 Data related to non- Hispanics was gathered through telephone interviews conducted by Princeton Survey Research Associates between August 1-31, 2006, among a sample of 2,928 adults, aged 18 and older.